Large majorities of Americans say neither President Donald Trump nor Congress are doing enough to try to prevent mass shootings like the one that took 17 lives in Parkland, Florida, last week, with improved mental health screening and treatment leading the public’s preferences for action. Most in a new ABC News/Washington Post poll, 58 percent, say stricter gun laws could have prevented the Valentine’s Day massacre at Marjory Stoneman Douglas High School. But which laws remains an open question: A ban on assault weapons still splits the country evenly, with no change from 2016. See PDF for full results, charts and tables. Students stage a “lie-in” outside the White House on Feb. 19, 2018, to demand gun control legislation in the wake of the school shooting that took place in Parkland, Fla.
Far more, 77 percent, say better mental-health monitoring and treatment could have prevented the Parkland shooting. Much lower on the list is allowing teachers to carry guns, called an “opportunity and an option” by Education Secretary Betsy DeVos last week. Forty-two percent think this could have prevented the killings. Desire for action is evident in this poll, produced for ABC News by Langer Research Associates: Seventy-seven percent of Americans say Congress is not doing enough to try to stop such shootings, and 62 percent say the same of Trump. Large numbers feel “strongly” that action to date has been inadequate — 59 percent in the case of Congress, 50 percent as to Trump. The public’s especially broad endorsement of improved mental health screening and treatment is in line with another result: Americans by a 2-to-1 margin blame mass shootings mainly on problems identifying and treating people with mental health problems, rather than on inadequate gun control laws. 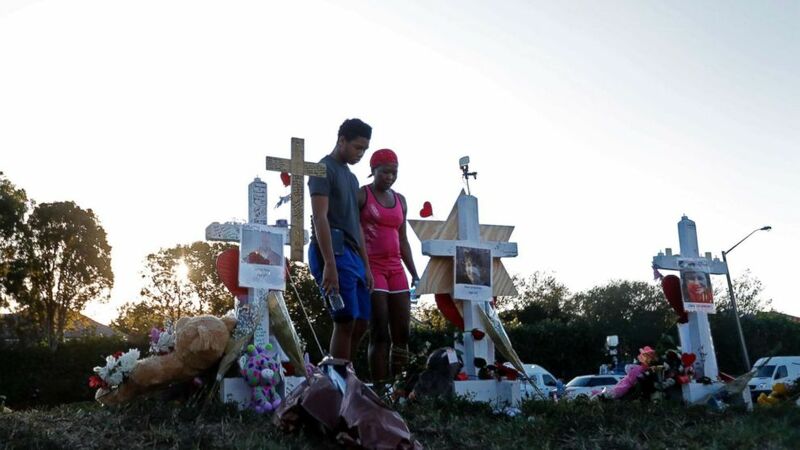 Melissa Goldsmith visits a makeshift memorial setup in front of Marjory Stoneman Douglas High School on Feb. 18, 2018, in Parkland, Fla. Still, compared with a 2015 ABC News/Post survey, somewhat fewer mainly blame mental health screening (down 6 points) and somewhat more blame inadequate gun control laws (up 5 points). Greater concern about mental health screening over gun laws was 63-23 percent then, vs. 57-28 percent now. Support for mental health surveillance also was evident in a 2011 ABC News/Post survey after the shooting of then-Rep. Gabrielle Giffords, D-Ariz. An overwhelming 83 percent supported increased funding for a system to report individuals treated for mental illness to the federal database used to screen gun purchases. Banning assault weapons — the alleged shooter in Parkland wielded a semiautomatic AR-15-style rifle — remains more divisive, with 50 percent in support, 46 percent opposed. That’s almost identical to a 51-48 percent division in June 2016, after a gunman killed 49 at an Orlando nightclub. Results have ranged over time from a high of 80 percent support for an assault weapons ban in mid-1994 and a recent high of 58 percent in January 2013, to a low of 45 percent in late 2015. Views of inaction by the president and Congress are heavily influenced by partisanship, with a notable gender gap: Politically independent women are sharply more critical of Trump’s work on the issue than independent men, 77 vs. 56 percent, as well as more critical of Congress, 83 vs. 70 percent. Independent women also are 13 points more apt than independent men to think stricter gun control laws could have prevented the Parkland shooting (63 vs. 50 percent), 11 points less apt to think armed teachers could have done so (40 vs. 51 percent) and 12 points more likely to support banning assault weapons (51 vs. 39 percent). Opinions on banning assault weapons are marked by especially sharp differences among groups. Fifty-five percent of women support a ban, compared with 43 percent of men. That reflects a vast gap between white women (60 percent support) and white men (39 percent); there’s no such gender gap among nonwhites. The gap widens further comparing support for an assault weapons ban among college-educated white women (65 percent) vs. non-college white men (36 percent). Demonstrators lie on the ground during a “lie-in” demonstration supporting gun control reform near the White House on Feb. 19, 2018. Support for banning assault weapons soars to 66 percent in the Northeast, vs. the mid-40s elsewhere. It’s somewhat higher in big cities and suburbs than in rural areas and small cities, 51 vs. 43 percent. And it’s a hugely political and ideological issue; 74 percent of liberals and 71 percent of Democrats support a ban, vs. support in the mid-40s among moderates and independents, dropping to about three in 10 conservatives and Republicans. At the widest gap, support ranges from 83 percent among liberal Democrats to 26 percent among conservative Republicans. These views also play out in red vs. blue states. Fifty-seven percent in states won by Hillary Clinton in 2016 support banning assault weapons, vs. 44 percent in states won by Trump. But here, too, gender plays a role. A ban is supported by 63 percent support of blue-state women, about half of blue-state men and red-state women alike and 38 percent of red-state men. In attitudes on whether problems with mental health screening or gun laws are chiefly at fault in mass shootings, men are more apt than women to cite mental health surveillance (62 vs. 53 percent), as are whites vs. nonwhites (62 vs. 48 percent). Political and ideological differences again are sweeping; 80 percent of Republicans chiefly blame mental health screening and treatment; 62 percent of independents agree, dropping to 33 percent of Democrats. In the 2016 red states, 64 percent mainly blame the mental health system; in the blue states, 47 percent. President Donald Trump speaks with Broward County Sheriff Scott Israel while visiting first responders at Broward County Sheriff’s Office in Pompano Beach, Fla., on Feb. 16, 2018. This ABC News/Washington Post poll was conducted by landline and cellular telephone Feb. 15 to Feb. 18, 2018, in English and Spanish, among a random national sample of 808 adults. Results have a margin of sampling error of 4.0 points, including the design effect. Partisan divisions are 31-24-40 percent, Democrats-Republicans-independents. The survey was produced for ABC News by Langer Research Associates of New York, N.Y., with sampling, data collection and tabulation by SSRS of Glen Mills, Pa. See details on the survey’s methodology here. What does it actually take to be a model? June 2, 2018 Comments Off on What does it actually take to be a model? March 4, 2019 Comments Off on Northern white rhinos: could science save the sub-species?